Our online Design Center is an excellent way to experiment with different designs for custom garage doors in Newbury Park CA. Using this tool you can easily mix and match different door materials, colors, finishes, window shapes, etc. to great the exact design you want. Don’t neglect to add the right decorative hardware to tie your garage door design together and make it match the overall architectural style of your home. 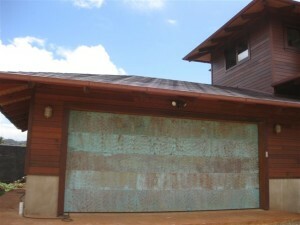 With any kind of garage door, proper installation is very important for the smooth and quiet operation of the door. In some cases, a bad installation job can actually ruin the door. For example, if the garage door isn’t balanced correctly when it is installed, it will not move evenly and the tracks and eventually the door itself could become twisted and warped. When it comes to custom garage doors in Newbury Park CA, professional installation is perhaps even more important because you’ve invested so much in your new doors. At Carroll Garage Doors, we provide expert, worry-free installation to protect your investment and ensure a long service life. Contact us today to create and install your new custom garage doors in Newbury Park CA.